We’d love your help. Let us know what’s wrong with this preview of Spelling the Hours by Rose Lemberg. To ask other readers questions about Spelling the Hours, please sign up. "noble, nobel" (na'amen) and "Augur Effect" (A.J. Odasso) are an interesting contrast, as they cover the same three women (Lise Meiter, Chien-Shiung Wu and Jocelyn Bell Burnell). The former poem is longer and considers the specific work of each involved. I liked the shifting rhythms as it goes from areas with This poetry collection contains twelve poems about marginalised people in science and technology. Each poem also has notes about the scientists featured in the poem, to provide some context. "noble, nobel" (na'amen) and "Augur Effect" (A.J. Odasso) are an interesting contrast, as they cover the same three women (Lise Meiter, Chien-Shiung Wu and Jocelyn Bell Burnell). The former poem is longer and considers the specific work of each involved. I liked the shifting rhythms as it goes from areas with short lines to longer passages. The latter poem takes a more personal approach, linking the poet's overlooked contributions to those of others, and how the poet was also part of erasing the names (however unknowingly) when writing about science. I do like that both poems were included, rather than trying to stick to one poem per scientist, as they provide very different approaches. My favourite poem was "Madrepore" (Mari Ness). Aquarium ecology interests me as a fishkeeper, but I also liked the connections back and forth between Anna Thynne's work and her family. Science doesn't happen in isolation from the rest of life. Another strong poem was "Never Cease" (Bogi Takács), which focuses on Rózsa Péter. This also handles how science interacts with life, but on a wider political scale. Rózsa was barred from her profession due to being Jewish. This is a bilingual poem in English and Hungarian. One of the most interesting structures was "Girl Hours" (Sofia Samatar), as it's like a scientific report in reverse. This one doesn't have addition notes at the end, as the notes come first as part of the poem. It wasn't my favourite in the collection, but I did like the choice of arrangement. The introduction by editor Rose Lemberg comments that the poets tended to write about people they already knew about, and had some meaning for them, rather than finding out about the people they didn't know. This did produce a range of responses, though I'd also be interested in who we might find by wandering in search of stories we didn't know existed. An area that didn't surface in the poems, despite some set during older history, were the accomplishments outside Europe before the impact of colonialism. It's a strong collection which will appeal to those who enjoy poetry with scientific themes. It delivered on its promise of highlighting marginalised people in science and technology, including a few who were new to me. Spelling the Hours edited by Rose Lemberg, subtitle Poetry Celebrating the Forgotten Others of Science and Technology, is not the kind of book I would usually go out of my way to pick up, mainly because I don't read very much poetry. I'd glad I did, though. The idea behind Spelling the Hours was to highlight some of the overlooked figures in science and technology. In practice, this means that it was a collection of poems about people other than straight cis men in science and tech. 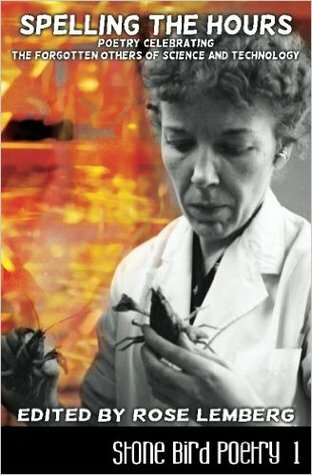 A lot of the Spelling the Hours edited by Rose Lemberg, subtitle Poetry Celebrating the Forgotten Others of Science and Technology, is not the kind of book I would usually go out of my way to pick up, mainly because I don't read very much poetry. I'd glad I did, though. The idea behind Spelling the Hours was to highlight some of the overlooked figures in science and technology. In practice, this means that it was a collection of poems about people other than straight cis men in science and tech. A lot of the poems were about women who did not get contemporaneous credit or recognition for their work. There was a lot of breadth in the topics covered from physics and astronomy to medicine and computing. Some of the names were familiar to me, like Jocelyn Bell and Lise Meitner, but most were not. I imagine that most readers will find at least some new names in this volume. I'm not going to comment on every poem individually. One that particularly stood out to me was "Girl Hours" by Sofia Samatar, the last poem in the chapbook. It focusses on Henrietta Swan Leavitt and the "girl hours" used to perform calculations. I liked how it mimicked the structure of a scientific paper but in reverse and it was a poignant note to end the chapbook on. They were all good poems though and I highly recommend this chapbook to fans of science and poetry and to anyone interested in hearing about some overlooked scientific names. I should add that, one of the reasons some of the names were familiar to me is because I am a scientist myself and some of these stories get around a bit more in the scientific community (I've seen an award named after Lise Meitner being presented and I heard about Jocelyn Bell pretty much when I learnt what a pulsar was). I imagine a different spread of names might be familiar (or more unfamiliar) to different people. Rose Lemberg is a queer, bigender immigrant from Eastern Europe and Israel. Their work has appeared in Lightspeed, Strange Horizons, Beneath Ceaseless Skies, Unlikely Story, Uncanny, and other venues. Rose is a Nebula Award nominee for their Birdverse novelette, "Grandmother-nai-Leylit's Cloth of Winds."